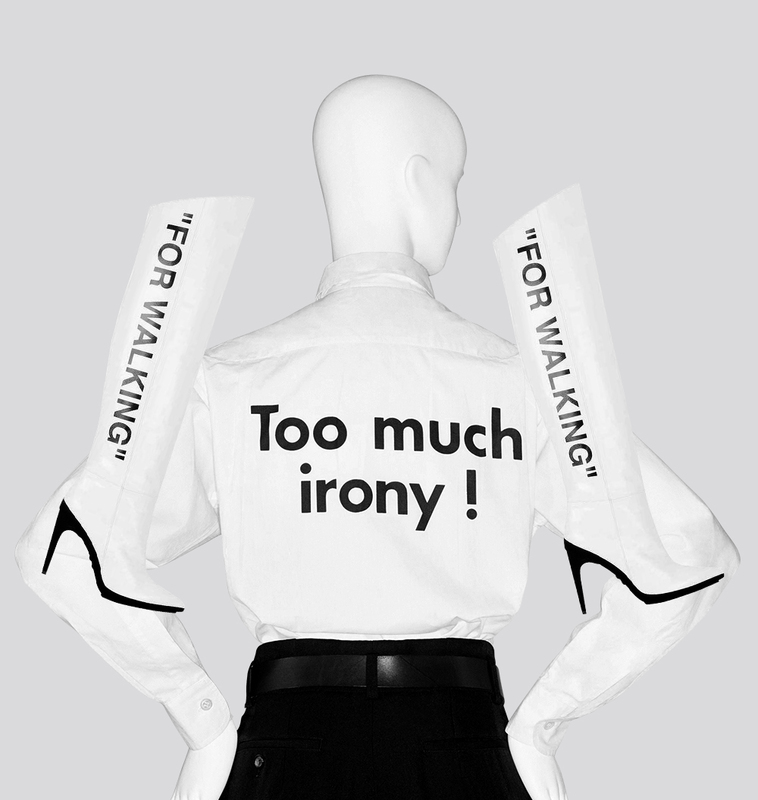 Recently, I encountered an image of a Moschino shirt from 1991, emblazoned in sans-serifed black letters across the back: “TOO MUCH IRONY.” The shirt made me think of my class of undergraduates to whom I teach rhetoric. We examine how irony has been used as a tool to examine latent social absurdities and hypocrisies, and allow subversive ideas to enter public spheres under censorship. Since the 2016 election, I’ve noticed that my students are more resistant to irony or camp as a political tool — many articulated that they felt the use of irony seemed a maneuver aimed at rhetorical superiority over those doing the often futile work of earnestly believing in or fighting for something. 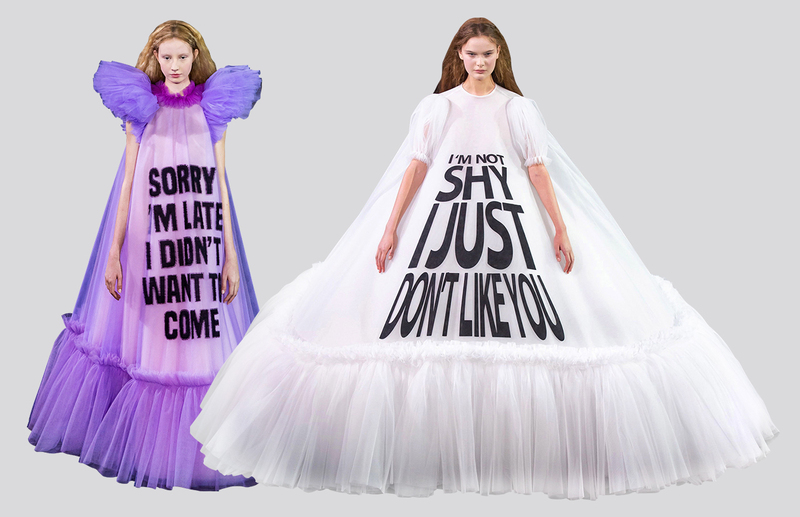 Yet ironic, campy clothing seems to be ubiquitous among them: this term, I saw many Vetements hoodies emblazoned with slogans like “May the Bridges I Burn Light the Way,” or expressions adjacent to those in Viktor & Rolf’s meme-gowns: “I’m not shy, I just don’t like you,” “Sorry I’m late, I didn’t want to come,” etc. The question lingering in my mind as I look out over a classroom-sea of Anti Social Social Club hoodies is the same as that after watching a recent Vetements or Balenciaga show: are we in on the joke? The Sun King himself consolidated his power by compelling the French nobility to abandon their country strongholds and to gather at Versailles, the glittering showplace that he had built a suitable distance from Paris, where the elaborate protocol and demands of dress forced them to squander vast sums literally to keep up appearances. The king ordered elaborate court ballets that required complex costuming, and established complex faux military camp cities made from canvas in which he and his courtiers paraded in yet more lavish ensembles. At Versailles, everything was pose and performance. Our most workable contemporary definition of “camp” comes from Susan Sontag’s 1964 essay, Notes on Camp: “The essence of Camp is its love of the unnatural: of artifice and exaggeration.” Sontag neutralized what was originally presented as a queer term, (pejorative or positive), depicting camp not as flashy nostalgia lacking in political or cultural substance, but as a defined aesthetic of irony, pastiche, excess, longing: “Camp sees everything in quotation marks,” she wrote, bringing to mind Virgil Abloh’s zealous use of them. “It’s not a lamp, but a ‘lamp’; not a woman, but a ‘woman.’ To perceive Camp in objects and persons is to understand Being-as-Playing-a-Role. It is the farthest extension, in sensibility, of the metaphor of life as theater.” Among Sontag’s camp-classifications: the ballet Swan Lake, Art Nouveau, Tiffany lamps, tabloid headlines and stories, Anita Ekberg parodying herself in Fellini’s La Dolce Vita. What does camp in fashion look like today? Lady Gaga’s meat dress, garishly ugly sneakers (Margiela, Prada, Acne Studios, Louis Vuitton), Rihanna’s pope-esque Met Gala costume, Alessandro Michele’s renaissance of over-the-top at Gucci, Off-White’s “For Walking” boots, Gucci’s Chateau Marmont laundry bags and Yankees caps, influencers holding more power than fashion editors, and the consumer revolt of streetwear. The Costume Institute exhibit will feature around 175 pieces, divided into two sections. The first will explore the origins of camp, from Versailles to the Stonewall riots, while the second will focus on contemporary designers, among them Demna Gvasalia, Miuccia Prada, Cristóbal Balenciaga, John Galliano, Anna Sui, Donatella Versace, Yves Saint Laurent, Jeremy Scott, and Rei Kawakubo. We ought to believe him. Even the house’s name — Vetements meaning “clothing” in French — seems poised to discount the body’s role in bringing the clothing to life. What makes these clothes “designed?” They’re just garments, Gvasalia tells us. 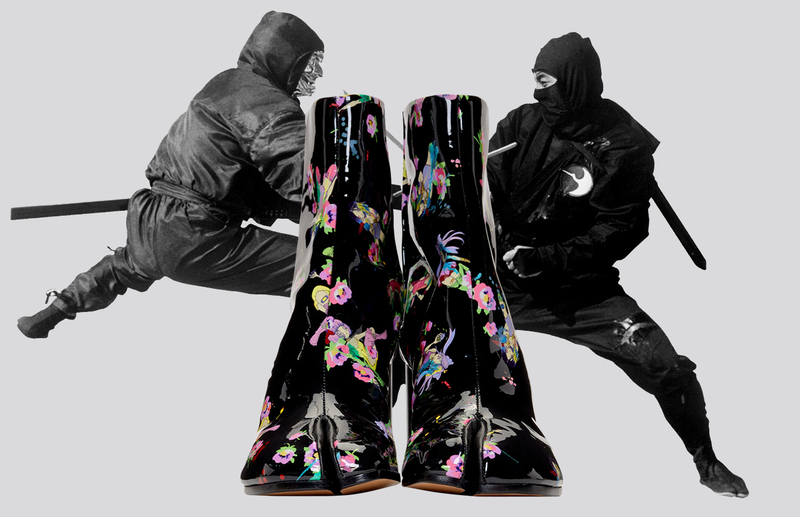 Ascribing subversive potential to fashion brands is sometimes part of the narrative we are sold, while other times, we come up with it on our own. 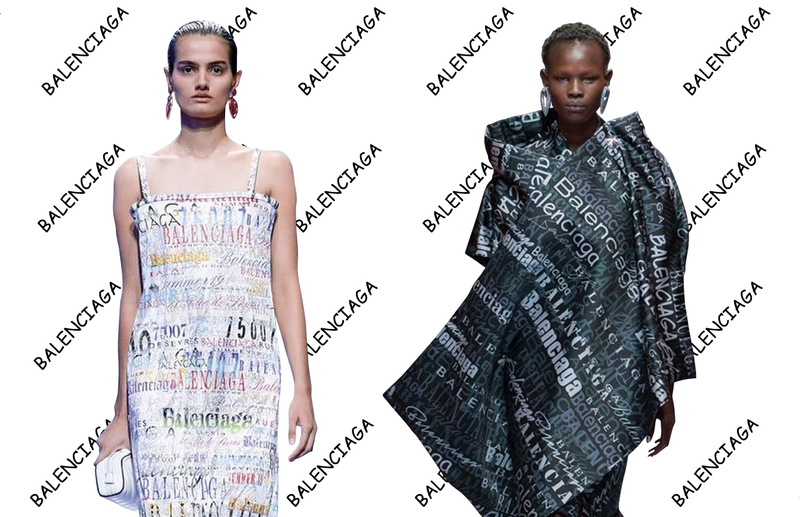 Gvasalia’s remarks are a refreshing reminder that we shouldn’t rely on fashion houses to be moral compasses or beacons of representation in the age of pop spirituality and vague, capitalist notions of “empowerment.” If the Vetements-Balenciaga complex is articulating something of cultural resonance, it is by showing the fashion industry holding a detached, self-referential mirror up to itself. Decadent, luxurious camp can be just as divisive. “Those are a lot,” my boyfriend said when he saw my pearl-encrusted mid-heeled Gucci loafers (he preferences the practical, hardline urban-minimalist aesthetic of Everlane or Acne Studios). “I’m a lot,” I retorted, acutely aware that my shoe collection suggests that I am a terrible leftist. But the camp of Michele’s Gucci is something of a caricature, conflating wealth and legacy with tacky flashiness — a despair-under-capitalism that is the antithesis of Kawakubo’s “stylish in secret” aesthetic. There’s no ethical consumption under capitalism, my loafers seemed to say. Wear the shoes.